Dramatically directing traffic for the Empire. I like a good basic action figure and Hasbro's Star Wars lines has had good basic action figures for awhile now. As a kid in the 80's, most of my action figures had the same 5 points of articulation. So it's my mental go to for an average action figure. I'm not going to lie, I do like the additional articulation of fancier figures, but I'm completely happy with the basic 5 points. I say that to start off, because I love the basic Star Wars figures. They're good looking representations of the characters and pretty much give me what I want at a relatively low price. The Imperial Ground Crew figure from the new Rogue One collection is a really solid basic action figure. He has a really good sculpt and a good looking deco. It's a good looking toy. 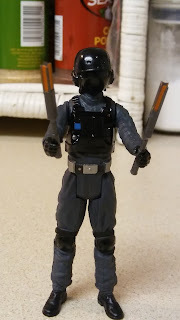 Included with the figure are his/her light batons. The figure can either hold the batons in his/her hands or store them on his/her back as part of the uniforms utility clothing. These light batons are not a weapon, however, they are a utility tool. You see, this is a figure of a member of the ground crew (as the name implies). One thing Star Wars figures has always excelled at is making toys out of every single on screen character no matter how big or small their role. A good reason not to take pictures of a toy in your kitchen is the lights bleeding out the Imperial sigil. As a member of the Imperial Ground Crew, this toy would direct vehicles into or out of stationary positions. Maybe the vehicle needs to be worked on. Maybe needs to be prepped for action, or even seeing to the vehicle upon it's return. Maybe the pilot needs help getting in or out. This kind of position is a reality in the real world and is represented often in works of fiction. 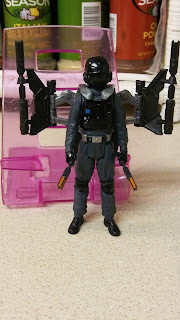 But good old Star Wars is one of the few toy lines that would take the time to make a figure of those nameless techs. Not just a figure, but a pretty good one. 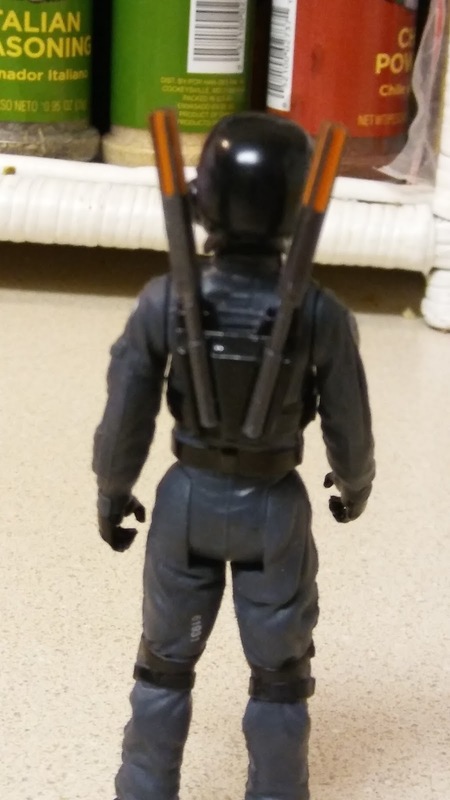 The Imperial Ground Crew figure's included Combat Gear (an exciting word for extra accessories) is a really neat jet pack. The jet pack has wings that fold out to an impressive wing span. With this jet pack, the Ground Crew member can take to the air to maybe escape the base's imminent explosion. 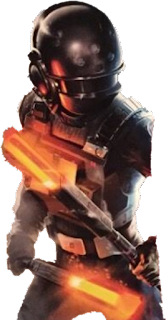 Or maybe the Ground Crew needs to lend a hand in a battle, as the jet pack is packing some on board blasters. It's a cool accessory and really adds to the figure. 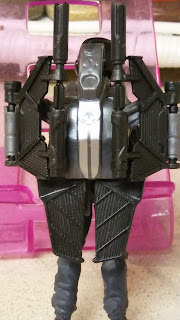 It's sculpting blends in with the figure and makes for a neater overall toy. I'm patiently waiting to see Rogue One this weekend, a figure like this really feeds my excitement as a fan of Star Wars and of toys in general. It makes for a good appetizer for what looks like an awesome movie.